The Building Bridges program was developed in 2006 and implemented in two phases. 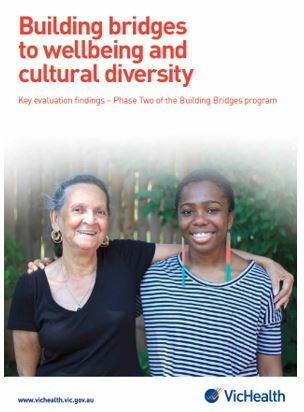 In the first phase, community organisations, schools and workplaces across Victoria were invited to submit funding applications for projects that supported contact between cultural groups under the conditions described above. Forty projects were funded for between six and 18 months. At the completion of these projects, five promising projects were selected for further development and funded for an additional three years. These projects focused on children and young people. Participating organisations were offered professional development and support from VicHealth. There was improvement in the mental health of participants in the Phase Two projects, particularly the mental health of new arrivals. The improvement in new arrival mental health came from the emphasis on collaborative activity – which helped to improve participant’s feelings of autonomy – and the opportunities projects provided for participants to form social connections and for new arrivals to learn English. However, there were mixed findings on the effectiveness of the projects in reducing prejudice. Take a gradual approach to planning the activity so that ownership of it is built gradually across the contact setting. Build in ice-breaking activities to promote interaction between participants so that they get to know one another and build relationships. Simply bringing people together may not be enough as people often remain unconnected or connected only with people from their like ethnic community. There can also be informal opportunities for people to get to know one another, such as encouraging participants to travel to and from activities together. Where appropriate, conduct activity to raise awareness, address stereotypes and promote the benefits of diversity before or during the contact activity. In some contexts it may not be appropriate to do this formally, but it is important to have a sound plan for dealing with issues should they arise.